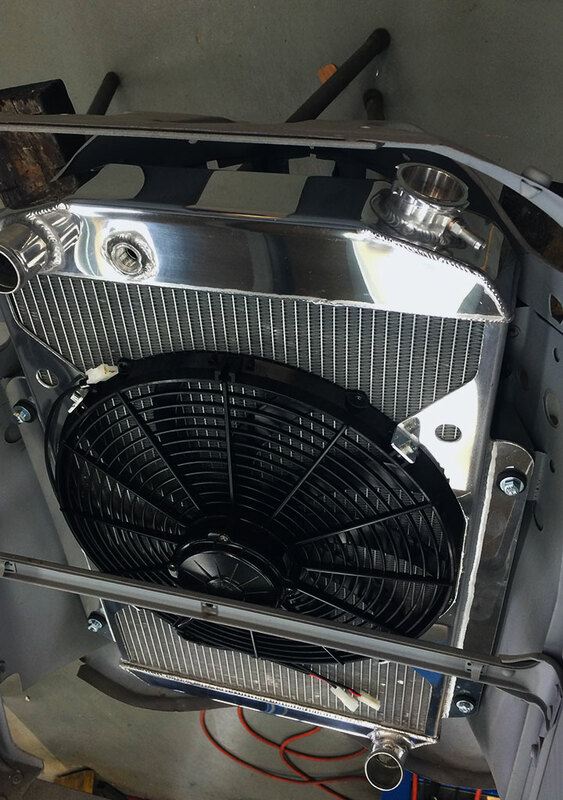 If your want “Radiator individuality”, why not speak to Andrew at Radiators Plus for interesting insights into what might work best in your next custom project car? At Radiators Plus we only use the highest quality Australia-made cores made-to-measure to suit your application. We custom-make your end tanks, TIG weld fittings, sidebands and mounting bosses to deliver the very best radiators for our customers. We can also custom-make radiators of any size with tanks welded top and bottom or in a crossflow style (welded to the sides). It all depends on the vehicle you’re installing one of our radiators in. A popular aftermarket addition is fitting twin or single thermo fans to the radiator. We have a huge range of aftermarket quality fans, namely “Spal” and “Maradyne”. We have our own unique mounting process where maximum air flow is achieved to deliver better performance. Fans are firmly mounted yet are easily unbolted for easy access. We’ll also weld in a thermo fan switch boss which makes for trouble-free motoring. Radiators Plus cater for all cars, 4x4s, trucks, buses, agricultural vehicles and motorbikes. Get in touch to discuss your project.